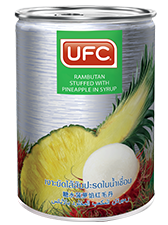 UFC Rambutan stuffed with pineapple in syrup is a concoction of sweet crunchy flavours of Rongrean rambutans balanced with the citrus of fresh Thai pineapples. Together the sweet and sour, and the two textures combine to make a genuine tropical desert. Simply refrigerate the product or add ice and you have your solution to a hot summer day.